The basic rules of the lunar diet for weight loss. In the new moon, you can easily get rid of the harmful substances that have accumulated in the body. If at the time of the new moon for several hours nothing is eaten, and a lot of drinking, the process will go faster. During the growing moon, the body perceives and absorbs everything from the surrounding world, putting off supplies. At this time gaining extra weight is easiest. Follow all the rules of nutrition on the growing Moon, without making allowances for yourself. In the full moon, it is better to eat more fruit, drink juices. These days our body is very susceptible, the body requires more food, therefore, this day can add extra pounds. On the waning moon, one must get rid of harmful substances and toxins that accumulate in the body. If you want to lose weight, try to eat a little less than you used to, then the weight will go away faster. All signs of the Zodiac belong to different elements - fire, water, earth and air. When the moon passes the sign of a certain element, we are most effectively learning a certain type of food. Taking certain food in combination with the phases of the moon and passing it through the signs of the zodiac has a significant impact on our health. Further recommendations are given on proper nutrition and weight loss for each day. If regularly, at least once a month, get on similar diets for the lunar calendar, you can achieve good results in combating excess kilograms and improve the overall state of your health. City New York. With the same quantity and quality of food we eat, we gain weight more easily with the growing Moon. Therefore, in the period 1 and 2 of the lunar phase, you should use different diets, do not get involved with high-calorie foods, if you want to lose weight. 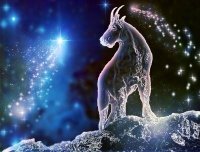 Like yesterday, the ☽ Moon in the sign of ♑ Capricorn 00°45'23"
When the Moon passes the signs of the Earth (Taurus, Virgo, Capricorn), the body needs more salt. Salt these days is almost harmless, so you can forget for a while that it is called a white death. Excess salt is really harmful to health, but in moderation everything is good and everything is useful. Salt, which we use these days, improves blood composition and is not put off where it is not supposed to. However, if you have serious contraindications regarding the use of salt, be careful. If there are no contraindications, then these days you can afford as many salty as you want. These days you can eat herring, pickles, salt nuts, you can slightly more than usual salt different dishes. Consumption of foods that contain many proteins, fats and carbohydrates, it is better to limit. When the Moon passes the signs of the elements of Water (Cancer, Scorpio, Pisces), the body especially needs carbohydrates. Many carbohydrates are found in bakery products, in sweet and flour dishes. Naturally, here, too, you need to know the measure, especially if you are overweight. But to eat bread and sweets in excess of the norm these days is not a sin - the harm will be less than usual, and the benefits are greater. But give up foods containing large amounts of fat, protein and salt.